but force your way into its secrets. raises the level of contentment within your life. Fine-tuned bowling does not happen by chance. 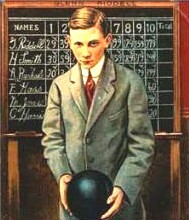 Good bowlers strengthen their understanding, and implement good technique into their bowling. Enhanced technique is the result of good physical and mental principles that control human movement and ball action. The best information is based on objective, factual inputs supplied by those who have learned the hard lessons. There is, of course, "more than one way to skin a cat". At the same time, some ways are better than others. We listen with an open heart. To deny the possibility of learning would seem unfair to ourselves and unwise.. It is important not to fall prey to blind adoration of those having impressive hooking balls or high scores. This is especially true of those having dominant personalities or commanding position. Most every bowler's game is flawed to a degree. Working with factual data provides the best opportunity to learn the sport of bowling with calm, straight-forward facts. Not understanding how things work is a key reason bowlers fail to reach the full enjoyment of their sport. The less successful they are, the harder they "throw" the ball, and the more flaws they introduce into their bowling. Bowling this way is less satisfying. We begin with well-founded principles, and work to understand the bowler, equipment and the lanes. Responding to change isn't just adjusting your feet or target, or throwing harder or softer. You may be well served by changing your targeting line, body angle, speed, ball launch, or a better selection from your ball arsenal. How you read the lanes, how your respond, and when you respond can enhance your success. Listen to what the lanes are telling you. A ball that matches the existing lane conditions, and your bowling style are instrumental to your success. The best ball for you is not necessarily the strongest hooking ball or the latest ball release. Each ball has strengths and limitations. Laying out your ball, and fitting your hand to meet specific objectives are key to enhancing your success. 'I will try again tomorrow'. 'I will learn a new skill'.